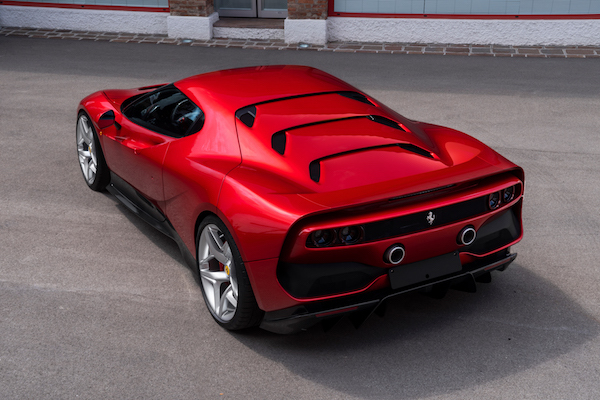 Ferrari has revealed its SP38 supercar, created by the company's One-Off program for one of its most favored customers, according to a press release Wednesday. The car flew from the Ferrari frying pan and into the fire at its Fiorani test track, where it was immediately put through its paces with a series of flying laps. As the SP38 is based upon the known quantity that is the 488 GTB, its driver was likely familiar with its platform-mate and would have had no trouble handling the re-bodied supercar. The carbon fiber body itself is painted in a three-layer metallic red paint, a new experiment for Ferrari. The company likens its front bumper design and thin lip to the 308 GTB of the late 1970s and early 1980s. The louvres over the engine replace the glass clamshell found on 488 GTBs, keeping its design distinct, and weight down. We daresay we even see a hint of Lancia Stratos in the glass based on how it wraps around the front of the cabin. 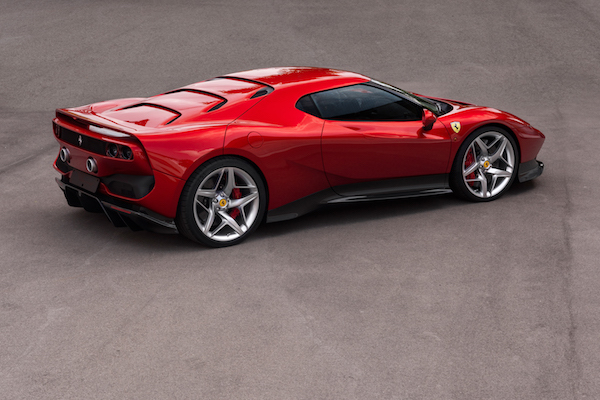 Ferrari stated that the SP38 is based upon the 488 GTB, not its more extreme performance variant, the 488 Pista, which was revealed earlier this year with boosted power, slashed curb weight, refined aerodynamics, and updated electronic aids. Maranello did not reveal who received the SP38 or for what price. The SP38 will make its public debut at this Saturday's Concorso d’Eleganza in Villa d’Este, Italy. The matching numbers 250 GT Berlinetta will sell from $8 to $11 million at the high-profile auction this month. The deal has nothing to do with his son's racing career, however.